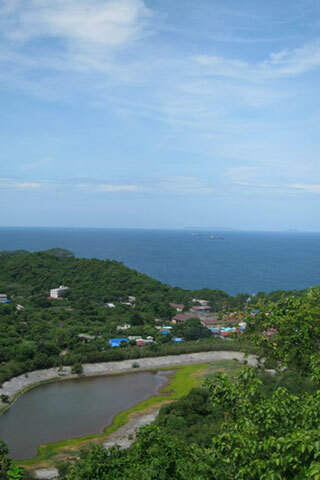 From the Buddha’s Footprint, situated high above the ground, you can see the lustrous Yellow Buddha, a glimpse of the only lake on the island, and a get a 360-degree view of the entirety of Ko Si Chang. Browse places to stay in Ko Si Chang on Booking.com. Book Now - Pay Only When You Stay. To catch pink, orange, and yellow sunsets that light up the evening sky, dine on the west side of the island. Asdang Pier, which is inside the palace grounds, is a white dock that juts out into the ocean, and a tempting photo opportunity. Chong Khao Kad, a white bridge that flanks the rocky coast, boasts seaside views and stairs that lead down to the lulling waters and up to a higher vantage point. The grounds surrounding Chong Khao Kad features a restaurant with seating over the water, scattered concession stands for snacks, and manicured lawns, perfect for a picnic. Browse our independent reviews of places to stay in and around Ko Si Chang. Read up on where to eat on Ko Si Chang. Check out our listings of things to do in and around Ko Si Chang. Read up on how to get to Ko Si Chang, or book your transport online with 12Go Asia. Planning on riding a scooter in Ko Si Chang? Please read this. See below for more sights and activities in Ko Si Chang that are listed on Travelfish.org.